· Supraventricular tachycardia (SVT) from reentry: This accounts for approximately 80% to 90% of all sustained SVT in the general population. Reentrant SVT results from abnormal propagation of the electrical impulse because of the presence of two separate pathways with different electrophysiologic properties. · There are four types of SVT from reentry. 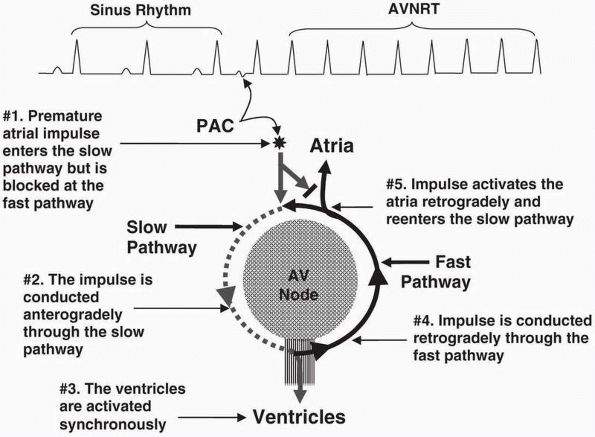 They are diagrammatically shown in Figure 16.1A-D.
o Atrioventricular nodal reentrant tachycardia (AVNRT): The reentrant circuit consists of a slow and fast pathway that circles around the AV node (Fig. 16.1A). o Atrioventricular reciprocating (or reentrant) tachycardia (AVRT): The tachycardia is associated with a bypass tract connecting the atrium directly to the ventricle (Fig. 16.1B). Figure 16.1: Supraventricular Tachycardia (SVT) from Reentry. (A) AV nodal reentrant tachycardia. The two pathways circle the AV node. This is the most common, occurring in more than 60% of all reentrant narrow complex tachycardia. (B) AV reciprocating tachycardia. This type of SVT is associated with a bypass tract connecting the atrium and ventricle. This is the next common occurring in approximately 30% of all reentrant SVT. (C) Sinoatrial reentrant tachycardia. The reentrant circuit involves the sinus node and adjacent atrium. This type of SVT is rare. (D) Intraatrial reentrant tachycardia. A micro-reentrant circuit is present within the atria. This type of SVT is also rare. The red circles represent the reentrant circuit. The arrows point to the direction of the reentrant circuit. AV, atrioventricular. o Sinoatrial reentrant tachycardia (SART): The tachycardia involves the sinus node and contiguous atrium (Fig. 16.1C). o Intra-atrial reentrant tachycardia (IART): The tachycardia is confined to a small circuit within the atrium (Fig. 16.1D). · AVNRT: AVNRT is the most common SVT occurring in the general population. It usually affects young and healthy individuals without evidence of structural heart disease and is twice more common in women than in men. Figure 16.2: Diagrammatic Representation of the Electrical Circuit in Atrioventricular Nodal Reentrant Tachycardia (AVNRT). Two separate pathways are present around the AV node, the slow pathway (dotted line), which conducts the impulse slowly and has a shorter refractory period and the fast pathway (solid line), which conducts rapidly and has a longer refractory period. The impulse circles the AV node repeatedly using these two separate pathways causing a reentrant tachycardia called AVNRT. · AVNRT is a type of reentrant SVT with two separate pathways. These two pathways have different electrophysiologic properties and are both located within or around the AV node. o Slow pathway: The slow pathway has a shorter refractory period. o Fast pathway: The fast pathway has a longer refractory period. · The slow pathway conducts the impulse anterogradely from atrium to ventricles. The QRS complex is narrow because the impulse follows the normal AV conduction system. The fast pathway conducts the impulse retrogradely to the atria. Because the atria are activated from below upward in a caudocranial direction, the P waves are inverted in leads II, III, and aVF (Fig. 16.2). Figure 16.3: Mechanism of AV Nodal Reentrant Tachycardia. A premature atrial complex (PAC) is conducted anterogradely through the slow pathway but is blocked at the fast pathway. 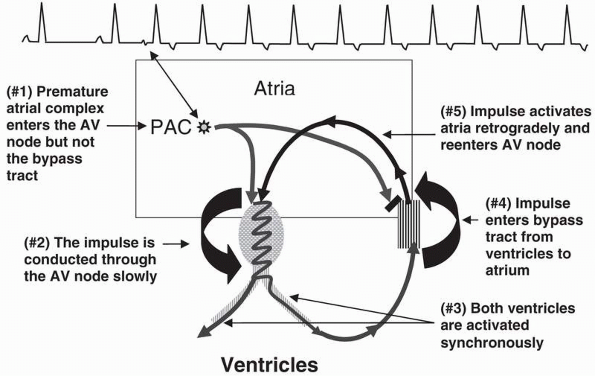 The impulse activates the ventricles and at the same time is conducted retrogradely through the fast pathway to activate the atria resulting in reentry (see text). AVNRT, atrioventricular nodal reentrant tachycardia. · Mechanism of AVNRT: AVNRT is triggered by a premature impulse originating from the atria or ventricles. o The premature atrial impulse should be perfectly timed to occur when the slow pathway has fully recovered from the previous impulse and the fast pathway is still refractory because of its longer refractory period. The premature atrial impulse enters the slow pathway, but is blocked at the fast pathway (Fig. 16.3, #1 and #2). o When the impulse reaches the end of the slow pathway, it can exit through the bundle of His to activate the ventricles (#3) and at the same time circles back through the fast pathway, which by now is fully recovered, to activate the atria retrogradely (#4 and #5). Figure 16.4: Diagrammatic Representation of Atrioventricular Nodal Reentrant Tachycardia (AVNRT). AVNRT is classically recognized as a narrow complex tachycardia with regular R-R intervals and no P waves. A complete 12-lead electrocardiogram of AVNRT is shown in Figure 16.5.
o The impulse can reenter the slow pathway and travels the same circuit repetitively causing a reentrant tachycardia called AVNRT. · Electrocardiogram (ECG) findings: The most common ECG presentation of AVNRT is the presence of a narrow complex tachycardia with regular R-R intervals and no visible P waves (Figs. 16.4 and 16.5). The P waves are retrograde and are inverted in leads II, III, and aVF, but are not visible in the ECG because the atria and ventricles are activated simultaneously; hence, the P waves are buried within the QRS complexes. This is the most common presentation occurring in 66% of all cases of AVNRT. · Other ECG patterns of AVNRT: In AVNRT, activation of the atria and ventricles may not be perfectly synchronous. If the retrograde P wave occurs immediately after the QRS complex, it may be mistaken for S wave in leads II, III, and aVF or r′ in V1. If the retrograde P wave occurs immediately before the QRS complex, it may be mistaken for q wave in lead II, III, or aVF (Fig. 16.6). 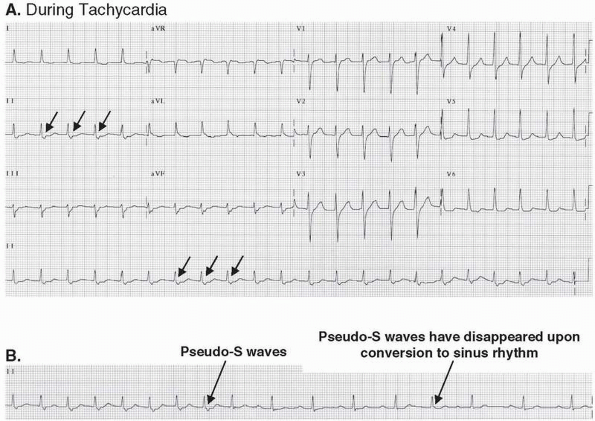 These pseudo-Q, pseudo-S, and pseudo-r′ waves should resolve on conversion of the tachycardia to normal sinus rhythm (Fig. 16.7). Figure 16.5: Twelve-Lead Electrocardiogram of Atrioventricular Nodal Reentrant Tachycardia (AVNRT). “No P waves.” Twelve-lead electrocardiogram showing AVNRT. The retrograde P waves are superimposed within the QRS complexes and are not visible in any of the 12 leads. This is the most common presentation of AVNRT. · Examples of pseudo-S waves in leads II or pseudo-r′ in V1 are shown (See Figs 16.8,16.9,16.10). This pattern is diagnostic of AVNRT and is seen in approximately 30% of all cases. The pseudo-S waves in lead II and pseudo-r′ in V1 are retrograde P waves, but are commonly mistaken as part of the QRS complex. These P waves should resolve when the AVNRT converts to normal sinus rhythm, as shown in Figures 16.7 and 16.8. · AVNRT can also manifest in the ECG by the presence of retrograde P waves much further away from the QRS complexes. The retrograde P waves may distort the ST segment rather than the terminal portion of the QRS complex as shown in Figures 16.11 and 16.12. Generally, when the P waves are no longer connected to the QRS complexes, the SVT is more commonly the result of AVRT rather than AVNRT. 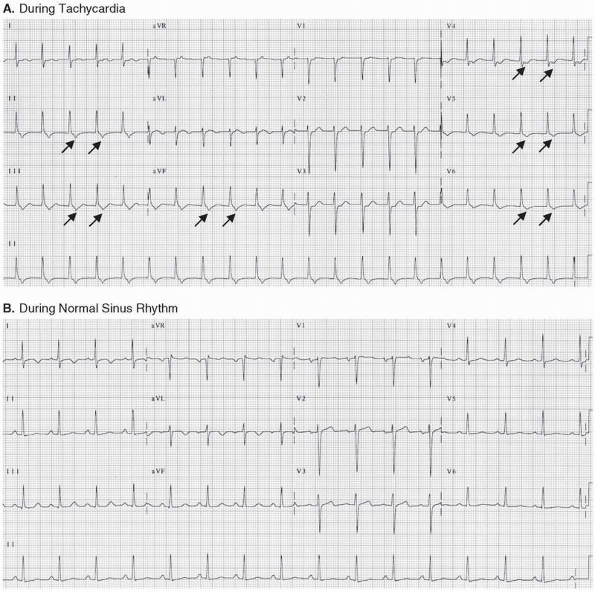 Figure 16.6: Pseudo-S and Pseudo-R′ waves in Atrioventricular Nodal Reentrant Tachycardia (AVNRT). In AVNRT, the retrograde P waves may emerge at the beginning or terminal portion of the QRS complexes and can be mistaken for pseudo-Q or pseudo-S waves in leads II, III, and aVF or as pseudo r′ waves in V1. These pseudo-q and pseudo-s waves in lead II and pseudo-r′ in V1 should resolve upon conversion of the tachycardia to normal sinus rhythm (see Fig. 16.7). · Atypical AVNRT: Finally, AVNRT can also manifest with retrograde P waves preceding each QRS complex (Figs. 16.13 and 16.14). This type of AVNRT is called atypical or uncommon and occurs infrequently. The tachycardia is initiated by an ectopic ventricular (rather than atrial) impulse. The impulse is retrogradely conducted to the atria through the slow pathway and anterogradely conducted to the ventricles through the fast pathway. This type of SVT may be difficult to differentiate from other narrow complex tachycardias, especially focal atrial tachycardia. 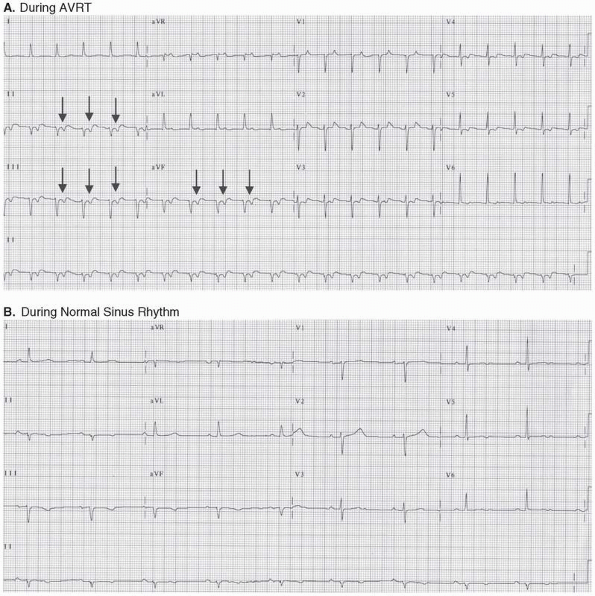 Figure 16.7: Atrioventricular Nodal Reentrant Tachycardia (AVNRT) Before and After Conversion to Sinus Rhythm. Note the presence of pseudo-S waves in lead II and pseudo r′ waves in V1 (left panel, circled) during AVNRT, which resolve on conversion to normal sinus rhythm. · AVNRT therefore has many possible ECG presentations and should be considered in any narrow complex tachycardia with regular R-R intervals whether or not retrograde P waves can be identified. 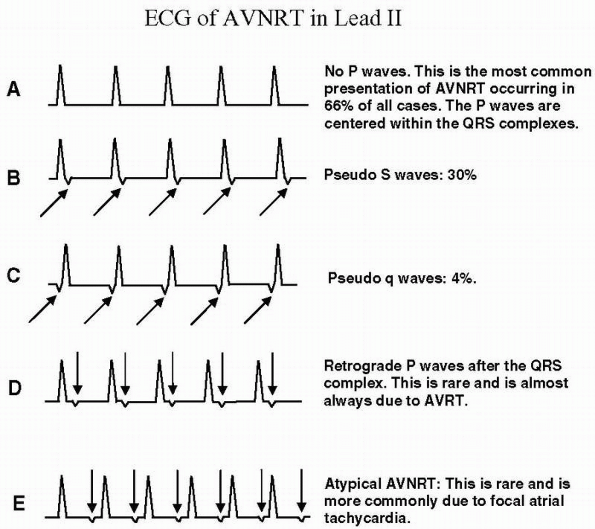 · Summary of ECG findings: Figure 16.15 is a summary of the different ECG patterns of AVNRT as recorded in lead II. o Typical AVNRT: Figures 16.15A-D are examples of typical AVNRT. The impulse is conducted anterogradely to the ventricles through the slow pathway and retrogradely to the atria through the fast pathway (slow/fast circuit). o Atypical AVNRT: Figure 16.15E is an example of atypical AVNRT. The impulse is conducted antero-gradely to the ventricles through the fast pathway and retrogradely to the atria through the slow pathway (fast/slow circuit). Figure 16.8: Atrioventricular Nodal Reentrant Tachycardia (AVNRT) with Pseudo-S and Pseudo-R′ waves. Complete 12-lead electrocardiogram during AVNRT is shown (A). Note the pseudo-S waves in leads II and aVF and pseudo-r′ in V1 (arrows), which are no longer present on conversion of the AVNRT to normal sinus rhythm (B). 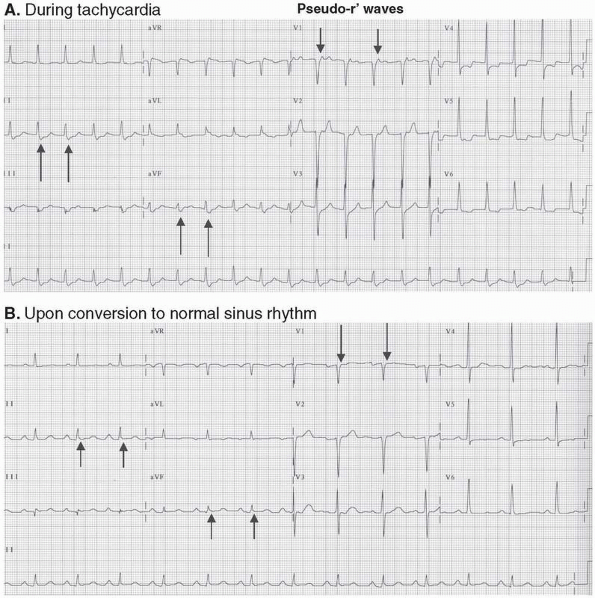 Figure 16.9: Spontaneous Conversion of Atrioventricular Nodal Reentrant Tachycardia (AVNRT) to Normal Sinus Rhythm. (A) A 12-lead ECG during AVNRT showing pseudo-S waves in lead II (arrows). (B) Lead II rhythm strip recorded from the same patient during tachycardia (left half of rhythm strip) and after spontaneous conversion to normal sinus rhythm (right half of rhythm strip). Note that the pseudo-S waves during AVNRT have disappeared (arrow). Figure 16.10: Conversion of Atrioventricular Nodal Reentrant Tachycardia (AVNRT) to Normal Sinus Rhythm with Adenosine.Adenosine is the drug of choice in converting AVNRT to normal sinus rhythm. The initial portion of the rhythm strip shows a narrow complex tachycardia with pseudo-S waves (arrows) in lead II consistent with AVNRT. Note the disappearance of the pseudo-S waves on conversion to sinus rhythm. Note also that the tachycardia terminated with a pseudo-S wave (last arrow), implying that the reentrant circuit was blocked at the slow pathway. Figure 16.11: Other Patterns of Atrioventricular Nodal Reentrant Tachycardia (AVNRT). Retrograde P waves (arrows) occur immediately after the QRS complexes and distort the ST segment or T waves of the previous complex. Although this pattern is consistent with AVNRT, this is more commonly the result of atrioventricular reentrant tachycardia. 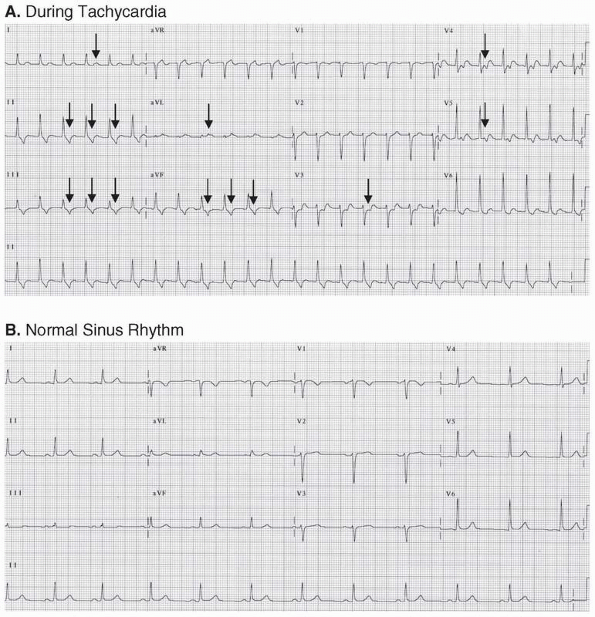 Figure 16.12: Twelve-lead Electrocardiogram Showing Other Presentations of Atrioventricular Nodal Reentrant Tachycardia (AVNRT).Twelve-lead electrocardiogram (A) and lead II rhythm strip from the same patient (B) showing retrograde P waves that are further away from the QRS complexes (arrows). Although this pattern is more typically seen in atrioventricular reentrant tachycardia, electrophysiologic study in this patient confirmed the presence of AVNRT with successful ablation of the slow pathway. Figure 16.13: Diagrammatic Representation of Atypical Atrioventricular Nodal Reentrant Tachycardia (AVNRT). Retrograde P waves (arrows) occur before the next QRS complex with R-P interval longer than PR interval. The impulse is conducted retrogradely through the slow pathway (SP) and anterogradely through the fast pathway (FP). · AVNRT is typically a narrow complex tachycardia with regular R-R intervals and no P waves. · When P waves are present, they are always retrograde because the atria are activated from below upward. The P waves therefore are inverted in leads II, III, and aVF. · Retrograde P waves may be present but may not be recognized when they are embedded within the QRS complexes. When the retrograde P waves distort the terminal portion of the QRS complexes, they can be mistaken for S waves in II, III, and aVF or r′ in V1. In rare instances, the retrograde P waves may distort the initial portion of the QRS complex and mistaken for q waves in lead II, III, and aVF. · The retrograde P waves may be inscribed immediately after the QRS complexes deforming the ST segment or T wave of the previous complex. · The retrograde P waves may be inscribed before the QRS complex. This type of AVNRT is called atypical or uncommon. Other atypical forms may be associated with retrograde P waves midway or almost midway between the QRS complexes. · The presence of second-degree AV block during tachycardia is possible but is rare and makes the diagnosis of AVNRT highly unlikely. · The ventricular rate in AVNRT varies from 110 to 250 beats per minute (bpm). The rate, however, is not helpful in distinguishing AVNRT from other types of SVT. · AVNRT should always be considered as a possible diagnosis in any narrow complex tachycardia with regular R-R intervals, regardless of the presence or absence of retrograde P waves because this is the most common type of SVT. Figure 16.14: Twelve-lead Electrocardiogram of Atypical Atrioventricular Nodal Reentrant Tachycardia (AVNRT). Inverted P waves are seen before the QRS complexes in leads II, III and aVF (arrows). Although this pattern is more commonly seen in other types of supraventricular tachycardia such as focal atrial or junctional tachycardia, this type of electrocardiogram can also occur in patients with atypical AVNRT. Figure 16.15: Summary of the Different Patterns of Atrioventricular Nodal Reentrant Tachycardia (AVNRT). 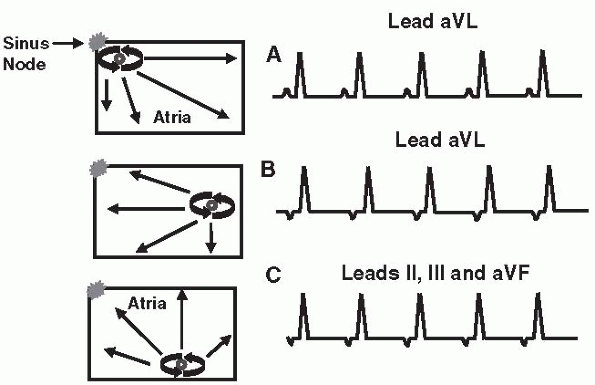 (A-E) The different possible electrocardiogram patterns of AVNRT in lead II. Arrows identify the retrograde P waves. · AVNRT is an example of microreentry associated with a circuit within or around the AV node. The reentrant circuit consists of two separate pathways with different electrical properties. The slow pathway has a short refractory period and the fast pathway has a longer refractory period. The tachycardia is precipitated by an ectopic impulse originating from the atria or ventricles. The impulse has to occur when one pathway is still refractory and the other has completely recovered. The tachycardia has a narrow QRS complex because the impulse follows the normal conduction system and activates the ventricles normally. The rate of the tachycardia is very regular because the impulse follows a fixed circuit. · Second-degree AV block is unusual but is possible during AVNRT. It can potentially occur at the level of the His bundle or more distally, which is extremely rare when the tachycardia has narrow QRS complexes. · There are two types of AVNRT: typical and atypical. o Typical presentation: This is the most common presentation of AVNRT occurring in more than 90% of all cases. The slow pathway conducts the impulse to the ventricles and the fast pathway conducts the impulse to the atria. This type of AVNRT is often called the slow/fast circuit. § No P Waves: This is the most typical and most common presentation, occurring in approximately 66% of all AVNRT. The atrial impulse is conducted anterogradely to the ventricles through the slow pathway and retrogradely to the atria through the fast pathway. Activation of both atria and ventricles are simultaneous; thus, the P waves and QRS complexes are inscribed synchronously and no P waves are evident in the ECG. § Retrograde P waves: When P waves are present, they are inverted in leads II, III, and aVF because the atria are activated from below upward. The P waves may deform the terminal portion of the QRS complexes and mistaken for S waves in II, III, and aVF or r′ in V1. This occurs in approximately 30% of all AVNRT. The retrograde P waves may deform the initial portion of the QRS complex and mistaken for q waves in II, III, and aVF. This occurs in 4% of all AVNRT. The retrograde P waves may also deform the ST segment or the initial portion of the T wave, although this type of AVNRT is rare. o Atypical presentation: The fast pathway conducts the impulse to the ventricles and the slow pathway conducts the impulse to the atria. This fast/slow circuit is rare. § The atypical form is characterized by retrograde P waves in front of the QRS complexes. This is often precipitated by an ectopic ventricular impulse retrogradely conducted to the atria through the slow pathway and anterogradely conducted to the ventricles through the fast pathway. § Other atypical forms may be associated with retrograde P waves midway or almost midway between the QRS complexes. · SVT from reentry is the most common sustained narrow complex tachycardia in the general population accounting for approximately 80% to 90% of all SVT. Among the SVT due to reentry, AVNRT is the most common occurring in more than 60% of all reentrant SVT. AVNRT is frequently seen in normal healthy individuals without structural cardiac disease and is more common in females. · AVNRT can occur suddenly and terminate abruptly and is therefore paroxysmal. This contrasts with sinus tachycardia where the tachycardia is nonparoxysmal with gradual onset and gradual termination. SVT from reentry are usually episodic occurring for a few minutes to a few hours and are recurrent. Unlike SVT from enhanced automaticity, they are rarely incessant, meaning that the tachycardia rarely persists for >12 hours a day. · AVNRT is generally tolerable except in patients with stenotic valves, ischemic heart disease, left ventricular (LV) dysfunction, or cardiomyopathy. In these patients, hypotension or symptoms of low cardiac output, myocardial ischemia, heart failure, or actual syncope may occur during tachycardia. It can also cause symptoms even among healthy patients when the tachycardia is unusually rapid; thus, syncope can occur when the tachycardia starts abruptly with a very fast rate or terminates with a very long pause because of overdrive suppression of the sinus node. The latter occurs when the tachycardia is associated with sinus node dysfunction. It is rarely associated with mortality or morbidity in otherwise healthy individuals. · Although physical examination is usually not helpful in the diagnosis of SVT, prominent neck vein pulsations are often present and may be the patient's chief complaint during tachycardia. These neck vein pulsations are due to cannon A waves, which occur when atrial contraction is simultaneous with ventricular contraction due to retrograde P waves occurring within or immediately after the QRS complex. The tachycardia causes atrial stretch, which may be followed by a period of diuresis due to release of atrial natriuretic peptide. · Unless the patient is severely hypotensive or in cardiogenic shock, immediate electrical cardioversion is rarely necessary in patients with AVNRT because the tachycardia is well tolerated. Vagal maneuvers and pharmacologic therapy are usually very effective in terminating the tachycardia. · Vagal maneuvers: Vagal stimulation should be attempted as the initial therapeutic maneuver before any pharmacologic agent is given. The ECG should be recorded when vagal stimulation is performed because vagal stimulation is not only effective in terminating the tachycardia, but is also helpful as a diagnostic maneuver if the tachycardia turns out to be due to other arrhythmias. o Carotid sinus pressure: The most commonly used and most effective vagal maneuver in terminating SVT is carotid sinus pressure. Carotid sinus pressure is always performed under cardiac monitoring in the recumbent position. With the neck hyperextended, the common carotid artery is identified by its pulsations and followed distally as close to the mandible as possible, usually at the angle of the jaw where the artery bifurcates into external and internal carotid arteries. It is at this bifurcation where the carotid sinus is located. Carotid sinus pressure is performed by applying gentle but constant pressure to the pulsating artery using both middle and index fingers. Pressure should be applied initially only for a few seconds until slowing of the heart rate can be identified in the cardiac monitor. The maneuver can be repeated several more times by pressing the artery at longer intervals if needed, especially if the previous maneuvers are unsuccessful in eliciting any response. There is no need to rub or massage the artery or press the pulsating artery for longer than 5 seconds at a time. Constant gentle pressure on the artery is all that is necessary. Only one artery should be pressed at any time. If there is no response, the same maneuver should be tried on the other carotid artery. This maneuver can also be repeated if the SVT persists after a pharmacologic agent has been given, but is not effective in terminating the tachycardia. Occasionally, a tachycardia that is previously unresponsive to carotid sinus pressure may become more responsive after an intravenous medication such as calcium channel blocker or digoxin has been given. If carotid stenosis is suspected by the presence of a carotid bruit, carotid sinus pressure should not be attempted. o Pharyngeal stimulation: A tongue blade is positioned at the back of the tongue as if performing a routine oropharyngeal examination. The tongue blade is gently brushed to the pharynx to make the patient gag. o Valsalva maneuver: This can be performed by several methods. The simplest is to instruct the patient to tense the abdominal muscles by exhaling forcefully against a closed glottis. The examiner can also make a fist, which is gently placed on the patient's abdomen. The patient, who is recumbent, is instructed to resist by tensing the abdominal muscles as the examiner's fist is gently pressed on the abdomen. The procedure can also be performed by blowing forcefully through a spirometer, balloon, or brown bag. This can also be done by straining, as if the patient is lifting a heavy object. The patient, who is recumbent, is asked to cross both legs on top of one another and instructed to lift them together while resistance is being applied to prevent the legs from being lifted. The Valsalva maneuver should not be performed if the patient is severely hypertensive, in congestive failure, or if an acute coronary event is suspected or patient is hemodynamically unstable. o Diving reflex: When the face comes in contact with cold water, bradycardia usually occurs and is known as the diving reflex. This can be done at bedside by immersing the face in iced water. o Ocular pressure: This vagal maneuver is not recommended since retinal detachment may occur as a potential complication of the procedure especially if done forcefully. · Pharmacologic therapy: ABCD are the drugs of choice for the treatment of AVNRT. (A, adenosine; B, beta blockers; C, calcium channel blockers; D, digoxin). These drugs are not necessarily given in alphabetical order. · Adenosine: If vagal maneuvers are not successful in terminating the tachycardia, adenosine is the drug of choice for terminating AVNRT. o Adenosine should not be given if the patient has bronchospastic pulmonary disease because adenosine can precipitate asthma. o The initial dose of adenosine is 6 mg given as an intravenous bolus. The injection should be given rapidly within 1 to 2 seconds preferably to a proximal vein followed by a saline flush. If a peripheral vein is used, the arm where the injection was given should be immediately raised. If the arrhythmia has not converted to normal sinus rhythm, another bolus using a bigger dose of 12 mg is given IV. A third and final dose of 12 mg may be repeated if the tachycardia has not responded to the two previous doses. Approximately 60% of patients with AVNRT will convert with the first dose within 1 minute and up to 92% after a 12-mg dose. o Adenosine is very effective in terminating AVNRT, but is also helpful in the diagnosis of other arrhythmias especially atrial flutter with 2:1 block. A 12-lead ECG or a rhythm strip should be recorded when adenosine is injected. When adenosine converts AVNRT to normal sinus rhythm, the tachycardia ends with a retrograde P wave, implying that the tachycardia was blocked at the slow pathway, which is usually the most vulnerable part of the reentrant circuit. The response of AVRT to adenosine is similar, ending with a retrograde P wave because both tachycardias are AV node-dependent. Focal atrial tachycardia is not AV node-dependent, although it may respond to adenosine. When focal atrial tachycardia terminates, the tachycardia ends with a QRS complex rather than a P wave. Atrial flutter with 2:1 block will not respond to adenosine, but will slow the ventricular rate significantly allowing the diagnosis of atrial flutter to become obvious by the presence of a regular sawtooth, wavy undulating baseline between the QRS complexes. o Adenosine is potentiated by dipyridamole, since dipyridamole prevents the metabolic breakdown of adenosine. It is also potentiated by carbamazepine, which may result in prolonged asystole on conversion of the tachycardia to normal sinus rhythm. If the patient is taking dipyridamole or carbamazepine, the initial dose should be cut in half to 3 mg.
o Theophylline is the antidote for adenosine. If the patient is on theophylline, higher doses of adenosine may be given to treat the SVT if there is no history of bronchospastic pulmonary disease. If the patient has reactive airway disease, adenosine can cause bronchospasm. · If the SVT has not responded after three doses of adenosine or if adenosine is contraindicated, another pharmacologic agent should be tried. The choice of the next pharmacologic agent will depend on the presence or absence of LV dysfunction or clinical congestive heart failure. § Calcium channel clockers: In patients with preserved LV function, the next drug of choice after failure to terminate AVNRT with adenosine is verapamil or diltiazem. If the patient is not hypotensive, 2.5 to 5 mg of verapamil is given IV slowly over 2 minutes under careful ECG and blood pressure monitoring. If there is no response and the patient remains stable, additional doses of 5 to 10 mg may be given every 15 to 30 minutes until a total dose of 20 mg is given. Alternate dosing with verapamil is to give 5 mg boluses every 15 minutes not to exceed 30 mg. Verapamil is effective in up to 90% of patients. Verapamil is a hypotensive and negatively inotropic agent and should not be given when there is congestive heart failure or LV dysfunction. Diltiazem is another calcium channel blocker that can be given at an initial dose of 0.25 mg per kg (equivalent to approximately 15 to 20 mg in a 70-kg patient) over 2 minutes. If the tachycardia has not terminated with the first bolus, a higher dose of 0.35 mg/kg or 25 mg is given after 15 minutes. This is followed by a maintenance IV dose of 5 to 15 mg/hour if needed. Diltiazem is shorter acting and less hypotensive than verapamil and may be better tolerated in some patients. In patients who become hypotensive with verapamil or diltiazem, calcium gluconate or calcium chloride 5% 10 mL may be given intravenously to reverse the hypotension. For more detailed dosing of verapamil or diltiazem, see Appendix. § Beta Blockers: Beta blockers (metoprolol, atenolol, propranolol, or esmolol) may be tried if the patient has not responded to the above therapy. Beta blockers should not be given when there is congestive heart failure or evidence of LV systolic dysfunction, hypotension, or bronchospastic pulmonary disease. § Metoprolol is given intravenously slowly at a dose of 5 mg and repeated two more times every 5 minutes if necessary for a total dose of 15 mg in 15 minutes. § Atenolol is given IV slowly 5 mg over 5 minutes and repeated once after 10 minutes if needed if the first dose was well tolerated. § Propranolol is given at a dose of 0.1 mg/kg. The drug is given IV slowly not to exceed 1 mg per minute until the arrhythmia is terminated. A second dose may be repeated after 2 minutes if needed. § Esmolol is given at an initial dose of 0.5 mg/kg infused over a minute. This is followed by a maintenance infusion of 0.05 mg/kg/min for the next 4 minutes (see Appendix for further dosing). If immediate control of SVT is necessary intraoperatively, a higher dose of 1 mg/kg may be given over 30 seconds followed by 150 mcg/kg/min maintenance infusion. § Digoxin: Digoxin has a slow onset of action and is not as effective as the previously discussed agents. The initial dose of digoxin in a patient who is not on oral digoxin is 0.5 mg given slowly IV for 5 minutes or longer. Subsequent doses of 0.25 mg IV should be given after 4 hours and repeated if needed for a total dose of no more than 1.5 mg over a 24-hour period. § Other antiarrhythmic agents that should be considered include type IA (procainamide), type IC (propafenone), or type III agents (amiodarone, ibutilide). The use of these agents requires expert consultation. These agents should be considered only if the SVT is resistant to the above pharmacologic agents. For more detailed dosing of these agents, see Appendix. § An old remedy, now seldom used, that should be considered when there is hypotension is acute elevation of systolic blood pressure with arterial vasopressors such as phenylephrine. Intravenous vasopressors may cause bradycardia and AV block by reflex vagal stimulation of baroreceptors in the carotid sinus. This may be considered when the patient is hypotensive but not when there is heart failure. The initial dose of phenylephrine is 100 mcg given as an IV bolus over 20 to 30 seconds and repeated in increments of 100 to 200 mcg. A total dose of 100 to 500 mcg is usually given, usual dose 200 mcg. The maximal dose depends on the blood pressure response, which should not exceed an arbitrary level of 180 mm Hg systolic. § Electrical cardioversion: In stable patients, synchronized electrical cardioversion is not encouraged. It should be attempted only as a last resort. o Presence of heart failure or LV systolic dysfunction (ejection fraction ≤40%). § Digoxin: Although digoxin may not be the most effective agent, it is the preferred agent when there is LV dysfunction, decompensated congestive heart failure, or hypotension. If the patient is not on oral digoxin, 0.5 mg is given intravenously as described previously. § Other agents: Nondihydropyridine calcium channel blockers (diltiazem or verapamil) should not be given when there is decompensated heart failure or LV dysfunction. Verapamil is contraindicated because it is negatively inotropic and has a longer half-life than diltiazem. Diltiazem may be more tolerable because of its shorter half-life and may be tried unless there is decompensated heart failure. The drug is given IV slowly at an initial dose of 15 to 20 mg (0.25 mg/kg). Intravenous beta blockers (metoprolol, atenolol, propranolol, esmolol) should not be given in the presence of LV dysfunction, heart failure, or bronchospastic pulmonary disease. Although beta blockers are indicated as long-term therapy for chronic congestive heart failure from systolic LV dysfunction, they are given orally in small doses and titrated slowly over several days. They should not be given in intravenous doses such as those used for the emergency treatment of SVT with preserved systolic LV function. § Antiarrhythmic agents: Amiodarone, a Class III agent, may be the only intravenous antiarrhythmic drug that may be tried when there is LV dysfunction. This agent, however, should be considered only if the SVT has not responded to the other agents. § Electrical cardioversion: Synchronized electrical cardioversion is rarely necessary and should be attempted only as a last resort. · Long-term therapy: Long-term oral therapy is generally given to prevent further recurrence of the arrhythmia, minimize symptoms, and improve quality of life rather than to prolong survival. o For patients with minimal or no symptoms during tachycardia, especially if the arrhythmia occurs only infrequently, no oral medications are needed. o For patients who develop symptoms of hemodynamic instability during AVNRT or those with recurrent and prolonged arrhythmias, chronic oral medical therapy may be tried. In patients without LV dysfunction, oral medications include calcium channel blockers (verapamil or diltiazem), beta blockers (atenolol, metoprolol, or propranolol), or digoxin. Although digoxin is less effective than the other agents, it may be the only oral agent that is appropriate for long-term maintenance therapy in patients with LV dysfunction. Beta blockers, such as carvedilol and metoprolol succinate, are standard agents for the treatment of systolic LV dysfunction and should be titrated slowly orally until an adequate maintenance dose is given that is also effective for controlling or preventing the tachycardia. o Catheter ablation of the reentrant circuit with a chance of permanent cure should be considered in patients who do not respond to medical therapy or those not willing to take oral medications. The success rate of catheter ablation is approximately 96% with a recurrence rate of 3% to 7% after successful ablation. Because the reentrant circuit is close to the AV node, there is a 1% or more chance of developing second- or third-degree AV block, which may require implantation of a permanent pacemaker. · Because most AVNRT occurs in young patients with structurally normal hearts, the tachycardia is usually tolerable and overall prognosis is excellent with a chance of permanent cure among patients who are willing to undergo electrical ablation. Figure 16.16: Orthodromic and Antidromic Atrioventricular Reentrant Tachycardia (AVRT). In orthodromic AVRT (A), the QRS complexes are narrow since the ventricles are activated through the normal AV conduction system. In antidromic AVRT (B), the QRS complexes are wide because the ventricles are activated through the bypass tract. · AVRT: AVRT is the second most common SVT occurring in approximately 30% of all reentrant SVT. This type of SVT is associated with a bypass tract that connects the atrium directly to the ventricle. · Normally, an atrial impulse can conduct to the ventricles only through the AV node. When a bypass tract is present, a second pathway is created for reentry to occur. Thus, an atrial impulse can enter the ventricles through the AV node and return to the atria through the bypass tract (Fig. 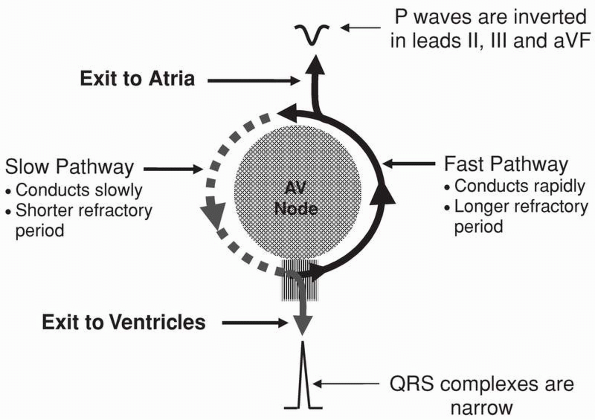 16.16A) or enter the ventricle through the bypass tract and return to the atria through the AV node (Fig. 16.16B). o AVRT with narrow QRS complexes: When the atrial impulse enters the ventricles through the AV node and returns to the atria through the bypass tract, the QRS complex will be narrow. This type of tachycardia is called orthodromic AVRT (Fig. 16.16A). Figure 16.17: Mechanism of Narrow Complex Atrioventricular Reentrant Tachycardia (AVRT). The diagram shows how a narrow complex AVRT is initiated by a premature atrial complex (PAC). The PAC finds the bypass tract still refractory because of its longer refractory period but is conducted through the AV node, which has a shorter refractory period, resulting in AVRT with narrow QRS complexes (see text). o AVRT with wide QRS complexes: When the atrial impulse enters the ventricles through the bypass tract and returns to the atria through the AV node, the QRS complex will be wide. This type of tachycardia is called antidromic AVRT (Fig. 16.16B). Antidromic AVRT is an example of SVT with wide QRS complexes and will be further discussed inChapter 20, Wolff-Parkinson-White Syndrome. · Mechanism: AVRT with narrow QRS complexes is triggered by a premature impulse originating from the atria or ventricles. The diagram below illustrates how the tachycardia is initiated by a premature atrial complex (PAC) (Fig. 16.17). o The PAC should be perfectly timed to occur when the AV node (the slow pathway) has fully recovered, while the bypass tract (the fast pathway) is still refractory from the previous impulse. Because the AV node has a shorter refractory period, the premature atrial impulse will enter the AV node but not the bypass tract (Fig. 16.17, #1). o The impulse conducts slowly through the AV node (#2) and activates the ventricles normally resulting in a narrow QRS complex (#3). After the ventricles are activated, the impulse circles back through the bypass tract (#4) and activates the atria retrogradely (#5). o After the atria are activated, the impulse can again enter the AV node and the circuit starts all over again. · In AVRT, the reentrant circuit involves a large mass of tissue consisting of the atria, AV node, bundle of His, bundle branches and fascicles, ventricles, and bypass tract before returning to the atria. AVRT therefore is a form of macro-reentry. o The atria and ventricles are essential components of the circuit; thus, activation of the atria and ventricles cannot be simultaneous. The P wave, therefore, cannot be buried within the QRS complex. It should always be inscribed outside the QRS complexes. o Because the atria are activated from the bypass tract, the P waves are inscribed retrogradely. The P waves are usually inverted in II, III, and aVF although the configuration of the P wave may vary depending on the location of the bypass tract. o Typically, the retrograde P waves are inscribed immediately after the QRS complexes and deform the ST segments. Thus, the R-P interval is shorter than the PR interval (Fig. 16.18). This is the typical or most common presentation of AVRT. o AV block is not possible during AVRT because the atria and ventricles are essential components of the circuit; thus, every retrograde P wave is always followed by a QRS complex during tachycardia. When AV block occurs, the reentrant circuit (and therefore the tachycardia) will terminate. · An example of AVRT is shown in Figure 16.19. Note that the P waves are retrograde and are inverted in leads II, III, and aVF and also in V4 to V6. The retrograde P wave is inscribed immediately after the QRS complex, deforming the ST segment of the previous QRS complex with an R-P interval that is shorter than the PR interval. Figure 16.18: Typical Atrioventricular Reentrant Tachycardia (AVRT). In AVRT, the retrograde P wave is inscribed immediately after the QRS complex with the R-P interval shorter than the PR interval. This is the typical or most common presentation of AVRT. 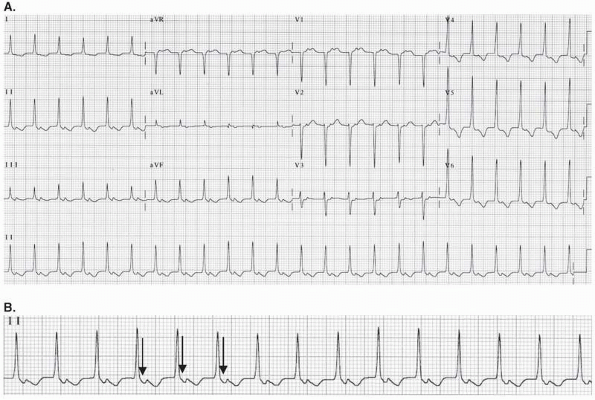 · Other examples of narrow complex tachycardia with retrograde P waves immediately after the QRS complex are shown in Figs. 16.20,16.21,16.22. The retrograde P waves may be mistaken for inverted T waves. · There are two types of narrow complex (orthodromic) AVRT: typical and atypical (see Figs. 16.22,16.23,16.24,16.25). o Typical AVRT: AVRT is typical when the retrograde P waves are inscribed immediately after the QRS complex and deform the ST segment or T wave of the preceding complex (Figs. 16.21 and 16.22). Conduction from ventricle to atrium across the bypass tract (R-P interval) is faster than conduction from atrium to ventricle across the AV node (PR interval); thus, the R-P interval is shorter than the PR interval. In typical AVRT, the AV node is the slow pathway and the bypass tract is the fast pathway (slow/fast activation). Virtually all cases of AVRT present in this manner. o Atypical AVRT: AVRT is atypical when the retrograde P waves occur in front of the QRS complexes (Fig. 16.23); thus, the R-P interval is longer than the PR interval. Atypical AVRT is associated with a slowly conducting bypass tract. Conduction from ventricle to atrium across the bypass tract (R-P interval) is slower than conduction from atrium to ventricle (PR interval) across the AV node (fast/slow activation). This type of AVRT is rare. The ECG of atypical AVRT is similar to that of atypical AVNRT. · Typical AVRT versus AVNRT: When retrograde P waves are inscribed immediately after the QRS complexes during tachycardia, AVRT may be difficult to differentiate from AVNRT (Fig. 16.24). One clue in differentiating AVRT from AVNRT is the duration of the R-P interval (Figs. 16.21 and 16.22A). The R-P interval in AVRT should measure ≥80 milliseconds in the surface ECG because this is the minimum time required for the impulse to travel from ventricles to atria across the bypass tract. If the retrograde P wave is too close to the QRS complex and the R-P interval is <80 milliseconds, as shown in Figure 16.22A, AVRT is unlikely and AVNRT is the more likely diagnosis. Figure 16.19: Twelve-lead Electrocardiogram in Atrioventricular Reentrant Tachycardia (AVRT). (A) A narrow complex tachycardia with retrograde P waves in II, III, aVF, and in V4 to V6 (arrows). The retrograde P waves are inscribed after the QRS complexes and deform the ST segments or T waves of the previous complex with an R-P interval shorter than PR interval. (B) The same patient after conversion to normal sinus rhythm. The retrograde P waves are no longer present. · Because the R-P interval in AVRT measure ≥80 milliseconds, the retrograde P waves are usually inscribed separately from the QRS complexes, whereas in AVNRT, the retrograde P waves are usually connected to the terminal portion of the QRS complexes. · Concealed bypass tract: In 30% to 40% of patients with AVRT, the bypass tract is concealed, indicating that the bypass tract is capable of conducting only in a retrograde fashion from ventricle to atrium but not from atrium to ventricle (see Chapter 20, Wolff-Parkinson-White Syndrome). Thus, the baseline ECG during normal sinus rhythm or upon conversion of the AVRT to normal sinus rhythm will not show any preexcitation (no delta wave or short PR interval). The presence of a bypass tract is suspected only when tachycardia from AVRT occur. · Manifest bypass tract: Patients with AVRT with manifest bypass tracts have preexcitation (delta wave and short PR interval) in baseline ECG during normal sinus rhythm. These bypass tracts are capable of conducting from atrium to ventricle and also from ventricle to atrium. This will be discussed more extensively in Chapter 20, Wolff-Parkinson-White Syndrome. Figure 16.20: Retrograde P Waves can be Mistaken for Inverted T Waves in Atrioventricular Reentrant Tachycardia (AVRT). (A) A 12-lead electrocardiogram (ECG) during tachycardia. The retrograde P wave is inscribed immediately after the QRS complex with the R-P interval shorter than the PR interval. This is the most common presentation of AVRT. The retrograde P waves may be mistaken for inverted T waves in II, III, and aVF (arrows). (B) A 12-lead ECG of the same patient upon conversion to normal sinus rhythm. The retrograde P waves are no longer present. Figure 16.21: The R-P Interval in Typical Atrioventricular Reentrant Tachycardia (AVRT). In typical AVRT, the R-P interval (measured from the onset of QRS complex to the onset of the retrograde P wave) should measure ≥80 ms. This is the time required for the impulse to travel from ventricles to atria retrogradely through the bypass tract. The length of the arrow in (B) indicates the R-P interval, which is the time required for the impulse to travel from ventricle to atrium across the bypass tract and is ≥80 ms. ms, milliseconds. Figure 16.22: Atrioventricular Nodal Reentrant Tachycardia (AVNRT). (A) Retrograde P waves are inscribed immediately behind the QRS complexes during tachycardia. Note that the R-P interval is <80 ms (distance between the two arrows), hence the tachycardia is AVNRT and not atrioventricular reentrant tachycardia (AVRT). In AVRT, at least 80 ms is required for the impulse to travel from ventricle to atrium across the bypass tract in the surface electrocardiogram. (B) Same patient on conversion to normal sinus rhythm. ms, milliseconds. Figure 16.23: Atypical Atrioventricular Reentrant Tachycardia (AVRT). In atypical AVRT, the retrograde P waves are inscribed in front of the QRS complexes with the R-P interval longer than PR interval. Atypical AVRT is associated with a slowly conducting bypass tract resulting in a long R-P interval. Figure 16.24: Typical Atrioventricular Reentrant Tachycardia (AVRT). Twelve-lead electrocardiogram showing typical AVRT. Retrograde P waves are present in leads II, III, and aVF (arrows) with R-P interval measuring 80 milliseconds. The R-P interval is shorter than the PR interval. Figure 16.25: Atypical Atrioventricular Reentrant Tachycardia (AVRT). In atypical AVRT, retrograde P waves are in front of the QRS complex (R-P interval longer than PR interval) because of the presence of a slowly conducting bypass tract. The supraventricular tachycardia is terminated by a perfectly timed premature atrial complex (arrow). · Electrical alternans: In electrical alternans, the amplitude of the QRS complexes alternates by more than 1 mm. Although electrical alternans is more commonly seen in AVRT (Fig. 16.26), electrical alternans can also occur with other types of SVT. Electrical alternans is more commonly a function of the heart rate rather than the type or mechanism of the SVT. Figure 16.26: Electrical Alternans. In electrical alternans, taller QRS complexes alternate with shorter QRS complexes by more than 1 mm. Arrows point to a tall QRS complex alternating with a smaller QRS complex. Electrical alternans is more commonly seen in atrioventricular reentrant tachycardia (AVRT) than with other types of supraventricular tachycardia (SVT) because the ventricular rate of AVRT is generally faster when compared with other types of SVT. · Localizing the bypass tract: Most bypass tracts are located at the free wall of the left ventricle (50% to 60%) followed by the posteroseptal area (20% to 30%), free wall of the right ventricle (10% to 20%), and the anteroseptal area (5%). The atrial insertion of the bypass tract can be localized by the configuration of the P wave during AVRT. The bypass tract can also be localized during sinus rhythm if the baseline ECG shows ventricular preexcitation. This is further discussed in Chapter 20, Wolff-Parkinson-White Syndrome. Figure 16.27: Localizing the Bypass Tract. If the P waves are inverted in lead I during tachycardia (A), the bypass tract is left sided. If the P waves are upright in lead I during the tachycardia (B), the bypass tract is right sided. Arrows represent the direction of atrial activation. 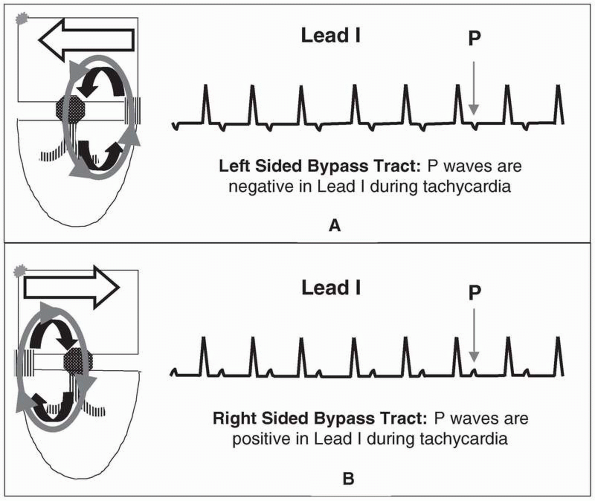 o Left-sided bypass tract: If the P waves are inverted in lead I during tachycardia, the direction of atrial activation is from left atrium to right atrium. This indicates that the bypass tract is left sided since the left atrium is activated earlier than the right atrium (Fig. 16.27A). o Right-sided bypass tract: If the P waves are upright in lead I, the direction of atrial activation is from right atrium to left atrium. Because the right atrium is activated earlier than the left atrium, the bypass tract is right sided (Figs. 16.27B and 16.28). Figure 16.28: Atrioventricular Reentrant Tachycardia (AVRT). (A) A 12-lead electrocardiogram during AVRT. The P waves are inverted in II, III, and aVF and upright in I and aVL (arrows). Retrograde P waves are also present in V3 to V5. The presence of upright P waves in I and aVL during AVRT suggests that atrial activation is from right to left consistent with a right sided bypass tract. Note that on conversion to normal sinus rhythm (B), no evidence of preexcitation is present. This type of AVRT is associated with a concealed bypass tract. o RBBB: If a rate-related RBBB occurs during tachycardia and the ventricular rate becomes slower, the bypass tract is right sided (Fig. 16.29). o LBBB: If a rate-related LBBB occurs and the ventricular rate becomes slower during the tachycardia, the bypass tract is left sided. Conversely, if the heart rate does not become slower, the bypass tract is at the opposite side. Figure 16.29: Localizing the Bypass Tract. 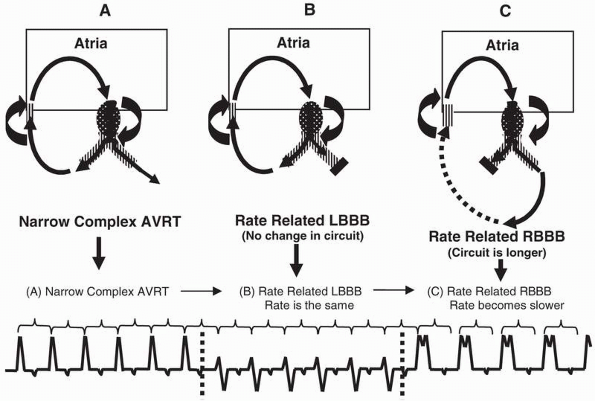 The diagrams explain how a rate-related bundle branch block will slow down the ventricular rate during AVRT if the bypass tract is on the same side as the bundle branch block. (A) Narrow complex AVRT with a right-sided bypass tract. (B) If a rate-related LBBB develops during tachycardia, the circuit is not altered by the bundle branch block and the rate of the tachycardia remains unchanged. (C) If a rate-related right bundle branch block occurs, the rate of the tachycardia will become slower if the bypass tract is right sided because the right ventricle and bypass tract have to be activated from the left bundle branch, resulting in a longer and slower circuit. AVRT, atrioventricular reentrant tachycardia; LBBB, left bundle branch block; RBBB, right bundle branch block. · Orthodromic AVRT is a narrow complex tachycardia with regular R-R intervals. · The P waves and QRS complexes are inscribed separately because the atria and ventricles are part of the reentrant circuit. · The configuration of the retrograde P waves may be different, depending on the location of the bypass tract. The P waves are commonly inverted in leads II, III, and aVF because the atria are activated by the bypass tract from below upward. · In typical AVRT, the retrograde P wave may be inscribed at the ST segment or T wave of the previous complex, thus, the retrograde P wave is closer to the previous QRS complex than the next QRS complex (R-P interval is shorter than the PR interval). · In atypical AVRT, the retrograde P waves are inscribed before the QRS complex and are closer to the next QRS complex than to the previous QRS complex (R-P interval longer than PR interval). · AV block is not possible during tachycardia. AVRT is excluded if AV block occurs. · Electrical alternans favors AVRT but does not exclude other types of SVT. · AVRT is a reentrant tachycardia associated with a bypass tract. The bypass tract connects the atrium directly to the ventricle and provides an alternate route by which the atrial impulse can conduct anterogradely to the ventricles and the ventricular impulse retrogradely to the atrium. · The tachycardia is precipitated by an ectopic impulse originating from the atria or ventricles. The ectopic impulse should occur when one pathway (either the AV node or bypass tract) has fully recovered and the other pathway is still refractory. · The tachycardia is very regular because the impulse follows a fixed pathway consisting of the AV node, bundle of His, a bundle branch, ventricle, bypass tract, and atrium. Second-degree AV block is not possible since the AV node is an essential component of the reentrant circuit. If the impulse is blocked at the AV node, the reentrant circuit will terminate. · The tachycardia may have wide or narrow complexes depending on how the ventricles are activated. o Antidromic AVRT: Antidromic AVRT is associated with wide QRS complexes. The QRS complex is wide because the atrial impulse activates the ventricles anterogradely through the bypass tract. Because the impulse is conducted outside the normal conduction system, the QRS complexes are wide measuring ≥0.12 seconds. Antidromic AVRT is a classic example of wide complex tachycardia due to SVT. This type of SVT can be mistaken for ventricular tachycardia. This is further discussed in Chapter 20, Wolff-Parkinson-White Syndrome. o Orthodromic AVRT: Orthodromic AVRT is associated with narrow QRS complexes. The QRS complex is narrow because the atrial impulse activates the ventricles anterogradely through the AV node. Because the ventricles are activated normally, the QRS complexes are narrow measuring <0.12 seconds. Orthodromic AVRT can be typical or atypical. § Typical AVRT: The P waves deform the ST segment or early portion of the T wave of the previous complex, thus the R-P interval is shorter than the PR interval. In typical AVRT, the AV node is the slow pathway and the bypass tract the fast pathway (slow/fast activation). § Atypical AVRT: The P waves precede the QRS complexes, thus, the R-P interval is longer than the PR interval. In atypical AVRT, the AV node is the fast pathway and the bypass tract the slow pathway (fast/slow activation). This type of AVRT is rare. · AVRT is the second most common SVT, occurring in approximately 30% of all reentrant SVT. It is another classic example of a tachycardia that is paroxysmal with abrupt onset and abrupt termination. · The bypass tract may be capable of conducting only retrogradely (ventricle to atrium) but not anterogradely (atrium to ventricle). Such bypass tracts are called concealed bypass tracts. When the bypass tract is concealed, preexcitation (presence of short PR interval and delta wave) is not present in the 12-lead ECG during normal sinus rhythm. Patients with AVRT with preexcitation during normal sinus rhythm have manifest bypass tracts. These patients with preexcitation and symptoms of tachycardia have WPW syndrome. · The location of the bypass tract can be diagnosed by the morphology of the P waves during SVT. o If the bypass tract is left sided, activation of the left atrium occurs earlier than the right atrium resulting in inverted P waves in lead I during the tachycardia. o If the bypass tract is right sided, the right atrium is activated before the left atrium, resulting in upright P waves in lead I during the tachycardia. o When a rate-related bundle branch block occurs and the rate of the tachycardia slows down, the bypass tract is on the same side as the bundle branch block. Thus, if rate-related RBBB occurs and the rate of the tachycardia is slower, the bypass tract is right sided. If LBBB occurs and the rate of the tachycardia is slower, the bypass tract is left sided. · Atypical AVRT: Although AVRT is almost always precipitated by an ectopic impulse, there is a subset of atypical AVRT in which the tachycardia may occur spontaneously during an abrupt onset of sinus tachycardia—such as during exertion, excitement, or enhanced sympathetic activity. This type of SVT should be recognized because it is usually incessant (the tachycardia lasts more than 12 hours per day) and may result in tachycardia mediated cardiomyopathy. This type of tachycardia is also called permanent junctional reciprocating tachycardia or PJRT. The tachycardia is associated with a slowly conducting bypass tract; thus, the P waves are in front of the QRS complex with R-P interval longer than PR interval. The bypass tract is located at the posteroseptal area very close to the orifice of the coronary sinus and may be treated successfully with radiofrequency ablation. The tachycardia is usually poorly responsive to medical therapy. · Because the retrograde P waves occur at the ST segment or T waves during tachycardia, contraction of the atria occurs during systole when the mitral and tricuspid valves are closed. This can cause cannon A waves, which are prominent jugular neck vein pulsations during tachycardia. The presence of cannon A waves in the neck during SVT suggests AVNRT or AVRT as the cause of the tachycardia. · The acute treatment of narrow complex AVRT is identical to that of AVNRT (see Treatment of AVNRT). Because AVRT is dependent on the AV node for perpetuation of the arrhythmia, treatment includes vagal maneuvers and pharmacologic agents that block the AV node. Similar to AVNRT, adenosine given intravenously is the drug of choice to terminate the tachycardia. The tachycardia ends with a retrograde P wave, meaning that the last part of the tachycardia to be recorded before the rhythm becomes sinus is a retrograde P wave. This implies that the tachycardia was blocked at the level of the AV node, regardless whether the AV node is a fast or slow pathway. Similar to adenosine, AV nodal blockers such as verapamil and diltiazem terminate the tachycardia at the level of the AV node causing a P wave to be inscribed last, before the rhythm converts to normal sinus. · Although adenosine is the drug of choice among patients with paroxysmal SVT, adenosine can precipitate asthma and should not be given to patients with history of severe reactive airway disease. Some of these patients with asthma may already be on theophylline, which is the antidote for adenosine. Adenosine is less effective for the treatment of SVT in patients who are already on theophylline. Figure 16.30: Sinoatrial Reentrant Tachycardia (SART). (A) Diagrammatic representation of SART. Because the sinus node is part of the reentrant circuit, the P waves resemble sinus tachycardia and are upright in leads II, III, and aVF. (B) Continuous lead II rhythm strip of a patient thought to have SART. The SART can be terminated (arrow 1) or precipitated (arrow 2) by premature atrial complexes and is paroxysmal. · Adenosine can potentially cause atrial fibrillation in 1% to 10% of patients. This can result in potential lethal complication among patients with AVRT with manifest bypass tracts (preexcitation or WPW pattern is present in baseline ECG). Atrial fibrillation in these patients can result in very rapid ventricular responses, which can result in hemodynamic collapse. This complication should be anticipated when treating AVRT so that a defibrillator is available if needed. · The prognosis of patients with orthodromic AVRT with concealed bypass tracts (no evidence of preexcitation in baseline ECG) is good. Similar to AVNRT, the arrhythmia can be permanently cured with electrical ablation. Patients should be referred to a facility with extensive experience. Early referral should be done if the tachycardia is recurrent or the patient cannot tolerate medications. · Patients with evidence of preexcitation during normal sinus rhythm may have a different prognosis (see Chapter 20, Wolff-Parkinson-White Syndrome). These patients may develop atrial fibrillation as a complication of the SVT and therefore can potentially develop arrhythmias that are more lethal. These patients with manifest bypass tracts and known WPW syndrome should be referred to an electrophysiologist for further evaluation. · There are two other types of SVT due to reentry: sinoatrial reentrant tachycardia (SART) and intra-atrial reentrant tachycardia (IART). These two types of reentrant SVT are relatively uncommon. · SART: SART is a type of micro-reentrant tachycardia involving the sinus node and contiguous atrium. The tachycardia is difficult to differentiate from sinus tachycardia because the sinus node is part of the reentrant circuit. During tachycardia, the P waves are identical to sinus P waves (Figs. 16.30 and 16.31) and easily mistaken for sinus tachycardia. · The tachycardia is usually precipitated and terminated by a premature atrial impulse and is therefore paroxysmal with an abrupt onset and abrupt termination (Fig. 16.30). This is in contrast to sinus tachycardia, which has a slow onset and gradual termination and is nonparoxysmal. SART can also be terminated by vagal maneuvers as well as agents that block the AV node because AV nodal blocking agents also inhibit the sinus node. This includes adenosine, beta blockers, calcium blockers, and digoxin. · Figure 16.31A,B show the difficulty in making a diagnosis of SART. Except for the abrupt onset and termination, the tachycardia is identical and easily mistaken for sinus tachycardia. 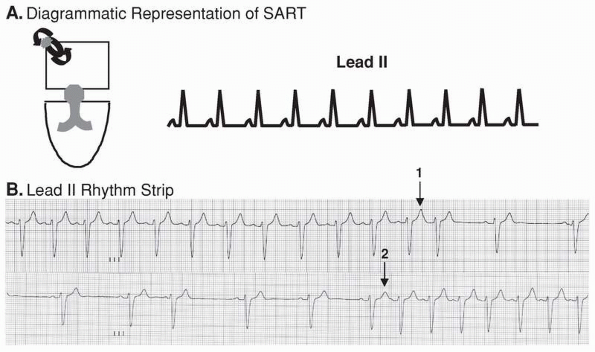 · The ECG of SART is identical to that of sinus tachycardia. The P waves precede the QRS complexes and are upright in leads I, II, and aVF. · The tachycardia is paroxysmal with abrupt onset and termination. · It is usually precipitated and can be terminated by premature atrial complexes. · The atrial rate is usually not very rapid and is usually 120 to 150 bpm but can be <100 bpm. · SART is another example of microreentry. The reentrant SVT includes the sinus node and surrounding atrial tissue. Because the sinus node is part of the reentrant pathway, the P waves during tachycardia resemble sinus P waves and may be difficult to differentiate from sinus tachycardia. Unlike sinus tachycardia, ectopic atrial impulses can terminate or precipitate SART. 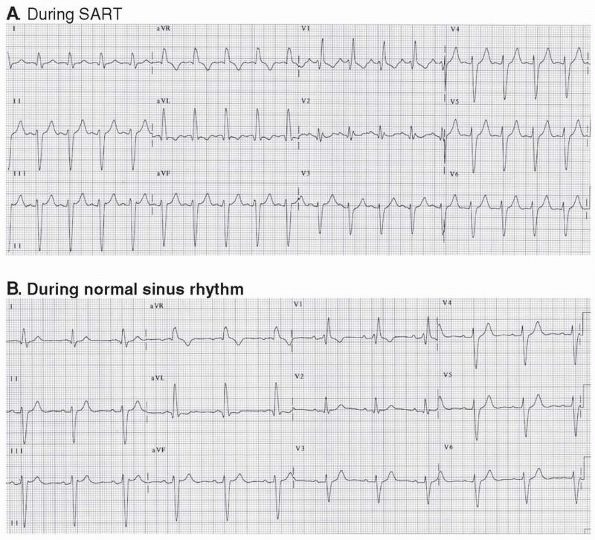 SART can also be precipitated or terminated by programmed electrical stimulation of the atrium similar to the other reentrant tachycardia and is paroxysmal with abrupt onset and abrupt termination. This is in contrast to sinus tachycardia, which is nonparoxysmal. Figure 16.31: Twelve-lead Electrocardiogram of Sinoatrial Reentrant Tachycardia (SART). (A, B) From the same patient. (A) A 1 2-ead electrocardiogram (ECG) during SART. (B) A 12-lead ECG immediately on conversion of the SART to normal sinus rhythm. Note that the P waves are virtually identical during tachycardia and during normal sinus rhythm. Most patients with SART are difficult to diagnose because the tachycardia is easily mistaken for sinus tachycardia. · SART is uncommon, occurring in <5% of all reentrant SVT. SART is usually associated with structural cardiac disease. · SART is difficult to differentiate from sinus tachycardia. Because SART involves the sinus node as part of the reentrant circuit, the morphology of the P waves resemble sinus tachycardia and are upright in leads I, II, and aVF. · The tachycardia can cause symptoms of lightheadedness but usually not syncope because the atrial rate is usually <120 to 150 bpm, rarely exceeds 180 bpm and can be slower than 100 bpm. P waves precede each QRS complex; thus, atrial contribution to LV filling is preserved during tachycardia. · Appropriate therapy is usually not instituted early because the tachycardia is easily mistaken for sinus tachycardia, which is a physiologic response to a variety of clinical situations. Because the sinus node is part of the reentrant circuit, it can be terminated by vagal maneuvers such as carotid sinus stimulation. It can also be terminated by AV nodal blockers including adenosine, beta blockers, calcium channel blockers, and digoxin because these agents also inhibit the sinus node. · In symptomatic patients, long-term therapy is usually effective in preventing recurrences. This may include oral beta blockers, nondihydropyridine calcium channel blockers such as diltiazem and verapamil, and digoxin. · Sinus node modification using radiofrequency ablation is often useful if the tachycardia is intractable to medications. · SART is usually well tolerated and therapy is given primarily to improve symptoms and prevent recurrence of the tachycardia. Because SART is associated with structural cardiac disease, prognosis will depend primarily on the underlying cardiac condition. · Intraatrial Reentrant Tachycardia: IART is another SVT due to reentry. The electrical circuit is confined to a small area in the atrium and therefore is a form of microreentry (Fig. 16.32). The reentrant circuit may be larger if it circles around a scar tissue or around a healed surgical incision such as a previous atrial septal defect repair. · The tachycardia starts from a focal area and spreads circumferentially to activate the whole atria. The morphology of the P wave will depend on the origin of the tachycardia; thus, the P wave may be upright, inverted, or biphasic in lead II. Because the tachycardia originates from the atria, the P waves are inscribed before the QRS complexes with a PR interval ≥0.12 seconds. Figure 16.32: Intraatrial Reentrant Tachycardia (IART). In IART, a micro-reentrant circuit is present in the atrium, which spreads circumferentially to activate the whole atria. IART is therefore included as an example of focal atrial tachycardia. The morphology of the P wave will depend on the origin of the tachycardia. (A) The P waves are upright or biphasic in lead aVL because the reentrant circuit originates from the right atrium close to the sinus node. (B) The P waves are inverted in lead aVL because the impulse originates from the left atrium. (C) The P waves are inverted in lead II, III, and aVF because the tachycardia originates from the bottom of the atria (see also Figs. 13.6 and 13.7). · Atrial tachycardia from IART is difficult to distinguish from atrial tachycardia resulting from enhanced or triggered automaticity using the surface ECG. Because these tachycardias all look alike electrocardiographically, they are all included as examples of focal atrial tachycardia regardless of the mechanism and will be further discussed in Chapter 17, Supraventricular Tachycardia due to Altered Automaticity. · The P waves are uniform in configuration and precede each QRS complex with a rate of 110 to 200 bpm. · The configuration of the P waves depends on the origin of the tachycardia and may be upright, biphasic or inverted in leads II, III, or aVF. · The atrial impulse is conducted to the ventricles through the normal AV conduction system; thus, the PR interval is usually ≥0.12 seconds. Because the tachycardia is not dependent on the AV node, AV block can occur. · IART is another example of microreentry within the atria. The reentrant circuit may be confined to a small area in the atrium because of inflammation, scarring, or previous surgery. The impulse spreads circumferentially until the whole atria are activated. The P waves are uniform in configuration since the impulse originates from a focal area in the atria. The P waves precede each QRS complex with PR interval shorter than R-P interval. · Although IART is an example of reentrant tachycardia, the ECG findings cannot be differentiated from other types of atrial tachycardia because of enhanced or triggered automaticity. Thus IART is included as an example of focal atrial tachycardia. The clinical significance, treatment, and prognosis of focal atrial tachycardia will be further discussed inChapter 17, Supraventricular Tachycardia due to Altered Automaticity, under Focal Atrial Tachycardia. 2005 American Heart Association Guidelines for Cardiopulmonary Resuscitation and Emergency Cardiovascular Care: part 7.3: management of symptomatic bradycardia and tachycardia. Circulation. 2005; 112:67-77. Botteron GW, Smith JM. Cardiac arrhythmias. In: Carey CF, Lee HH, Woeltje KF, eds. Washington Manual of Medical Therapeutics. 29th ed. Philadelphia: Lippincott; 1998:130-156. Chauhan VS, Krahn AD, Klein GJ, et al. Supraventricular tachycardia. Med Clin N Am. 2001;85:193-223. Dresing TJ, Schweikert RA, Packer DL. Atrioventricular nodal-dependent tachycardias. In: Topol EJ, ed. Textbook of Cardiovascular Medicine. 2nd ed. Philadelphia: Lippincott; 2002:1453-1478. Esberger D, Jones S, Morris F. ABC of clinical electrocardiography: junctional tachycardias. BMJ. 2002;324:662-665. Guidelines 2000 for Cardiopulmonary Resuscitation and Emergency Cardiovascular Care: 7D: the tachycardia algorithms. Circulation. 2000;102(suppl I):I-158-I-165. Kay GN, Pressley JC, Packer DL, et al. Value of the 12-lead electrocardiogram in discriminating atrioventricular nodal reciprocating tachycardia from circus movement atrioventricular tachycardia utilizing a retrograde accessory pathway. Am J Cardiol. 1987;59:296-300. Manolis AS, Mark Estes III NA. Supraventricular tachycardia mechanisms and therapy. Arch Intern Med. 1987;147:1706-1716. Olgen JE, Zipes DE. Specific arrhythmias: diagnosis and treatment. In: Libby P, Bonow RO, Mann DL, et al. eds. Braunwald's Heart Disease, A Textbook of Cardiovascular Medicine. 7th ed. Philadelphia: Elsevier Saunders; 2005:803-863. Saoudi N, Cosio F, Waldo A, et al. Classification of atrial flutter and regular atrial tachycardia according to electrophysiological mechanisms and anatomical bases. Eur Heart J. 2001;22: 1162-1182. Sinai Policies and Procedures on Intravenous Medications. LBHWeb at Sinai Hospital. Belvedere Avenue, Greenspring, Baltimore, MD: Sinai Policy and Procedures; January 15, 2003. Wagner GS. Reentrant junctional tachyarrhythmias. In: Marriott's Practical Electrocardiography. 10th ed. Philadelphia: Lippincott; 2001:328-344. Waldo AL, Biblo LA. Atrioventricular nodal-independent supraventricular tachycardias. In: Topol EJ, ed. Textbook of Cardiovascular Medicine. 2nd ed. Philadelphia: Lippincott; 2002:1453-1478. Waxman MB, Wald RW, Sharma AD, et al. Vagal techniques for termination of paroxysmal supraventricular tachycardia. Am J Cardiol. 1980;46:655-664. Wellens HJJ, Conover MB. Narrow QRS tachycardia. In: The ECG in Emergency Decision Making. 2nd ed. St. Louis: Saunders/Elsevier; 2006:92-126. Xie B, Thakur RK, Shah CP, et al. Clinical differentiation of narrow QRS complex tachycardias. In: Thakur RK, Reisdorff EJ, eds. Emergency Medicine Clinics of North America. Emergency Management of Cardiac Arrhythmias. 1998: 295-330. Webb JG, Kerr CR. Paroxysmal supraventricular tachycardia and bundle branch block. Arch Intern Med. 1987;147: 367-369.